“Encounter God: 21-Day Challenge” from Christian Faith Publishing authors, Gabrielle and Jennifer Walton is a three-week jump start to a life-changing encounter with God. This book provides advice on building devotional habits to enhance intimacy with the Lord, learn how to hear the voice of the Holy Spirit, and more. “Encounter God: 21-Day Challenge”: a daily devotional inspired by the desire for closeness with God. “Encounter God: 21-Day Challenge” is the creation of published authors and dynamic sisters, Gabrielle and Jennifer Walton who are passionate about helping people of all ages encounter God. “We are passionate about the presence of the Holy Spirit being revealed in the lives of people of all ages. “What we have learned is that to encounter God is to experience the wonders of His presence. And thanks be to Jesus, we can encounter Him at any given moment. Published by Christian Faith Publishing, Gabrielle and Jennifer Walton‘s new book is a three-week devotional guide dedicated to bringing God more closely into readers’ lives than ever before. View a synopsis of “Encounter God: 21-Day Challenge” on YouTube. Readers can purchase“Encounter God: 21-Day Challenge” at traditional brick and mortar bookstores, or online at Amazon.com, Apple iTunes store, Kobo or Barnes and Noble. 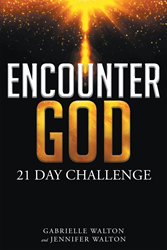 For additional information or inquiries about “Encounter God: 21-Day Challenge”, contact the Christian Faith Publishing media department at 866-554-0919.